Arugula, also called rocket, is a sadly underappreciated green leafy vegetable that’s much more nutritious than the standard lettuce, and delivers a flavor totally different from spinach. 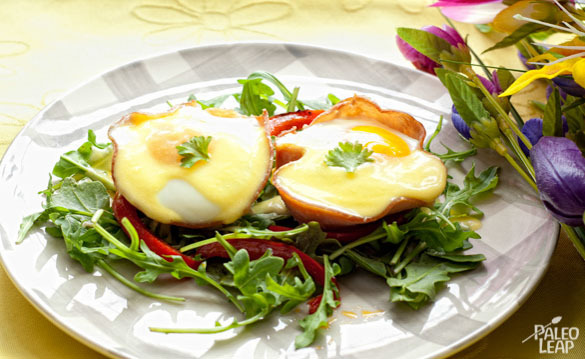 Arugula has a sharper, spicier taste, and the contrast with the richness of ham and eggs brings out the sophisticated side of this recipe. The arugula is delicious on its own, but you can also add a simple vinaigrette if you like (the recipe is included below). As well as the optional vinaigrette, this recipe uses the homemade hollandaise sauce included in the Paleo recipe book for extra flavor. This dressing is also optional if you don’t have time to make it – the arugula salad with the ham and eggs is just as good without it. The ham in this recipe might raise a few eyebrows – isn’t ham usually cured with sugar? It is, but it’s possible to get high-quality ham that isn’t full of added sugars and unsavory additives, just make sure to read the labels carefully or ask the butcher what’s in the product. Don’t let fear of cheap lunch meats prevent you from enjoying a tasty breakfast. 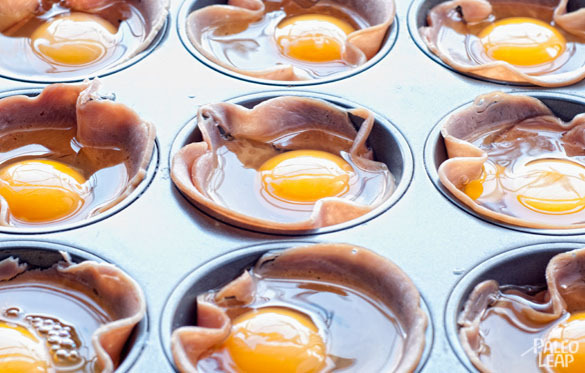 Note that to bake the ham and egg cups, you’ll need a muffin pan (finally, a chance for your old baking equipment to be useful again!). If you don’t have one, you can also make DIY molds out of aluminum foil; the sides won’t be as smooth, but the taste is the same.